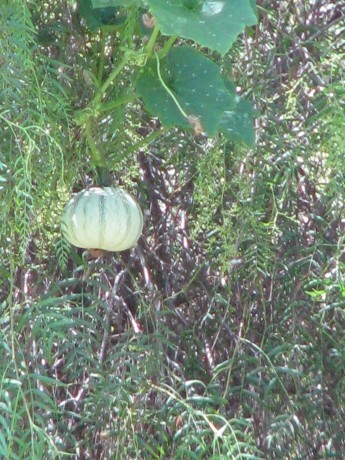 Pipian From Tuxpan squash, from Baker Creek Heirloom Organic Seeds. When planning a garden for lots of any size, be especially aware of vertical spaces. Have an unsightly fence? A wall that needs protection from the sun? A hot, bright patio? All of these areas are perfect for growing vertically. A Canada Crookneck climbs over a plum tree. 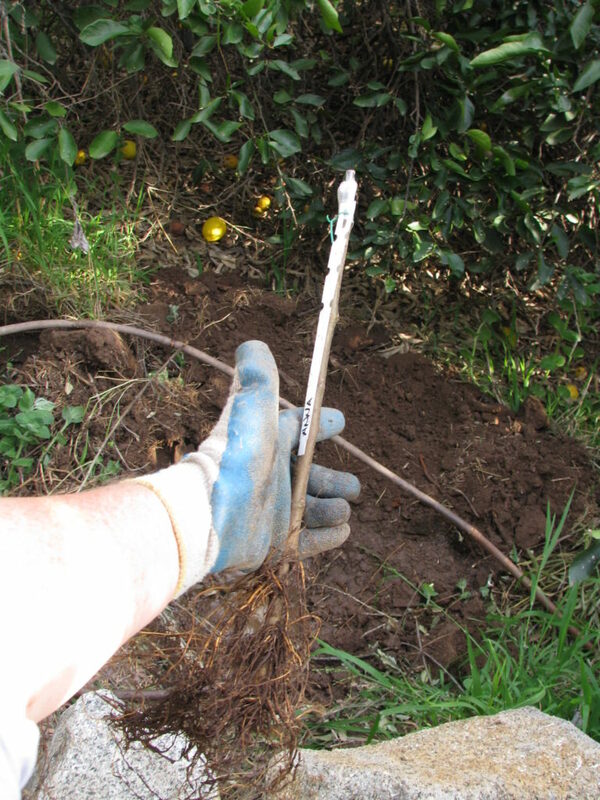 For an existing wooden fence, string wires vertically or in a crossed pattern, depending upon what you will be growing. 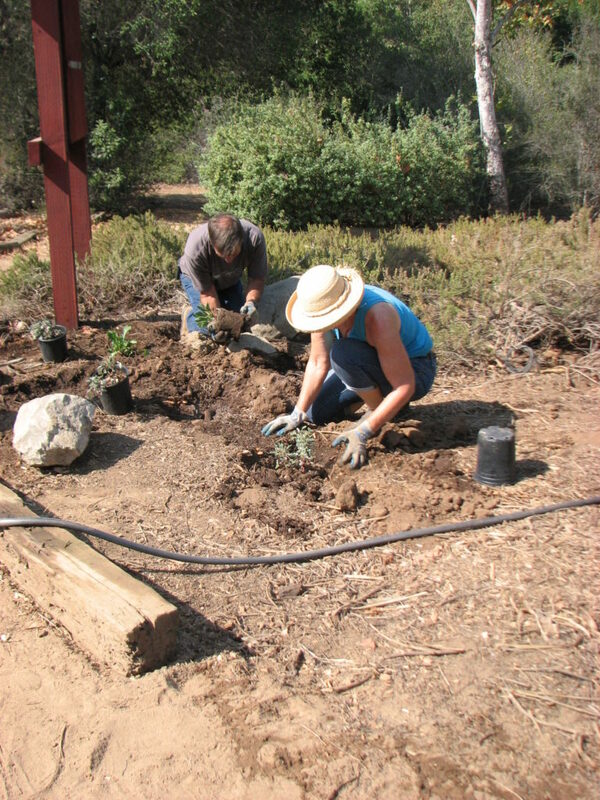 For a chain link fence… just plant! You can certainly grow annuals such as beans, squash and peas, but for perimeter fences I’d advise long-term plants that fill other functions as well. Heirloom climbing roses can cover a fence, create a barrier for trespassers, provide habitat, be ascetically pleasing, and provide edible flowers and vitamin C-rich hips. 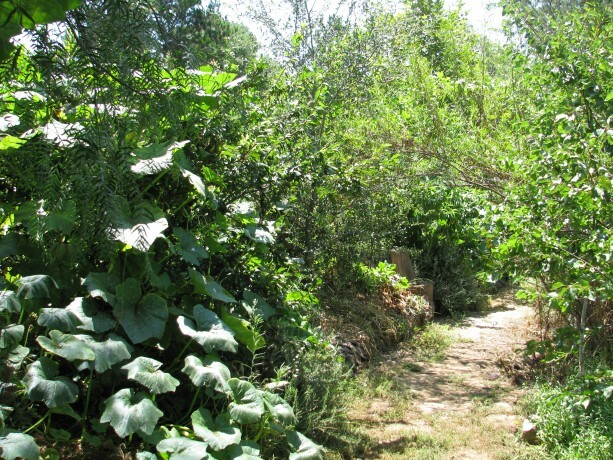 Remember that in permaculture everything should serve at least three purposes. 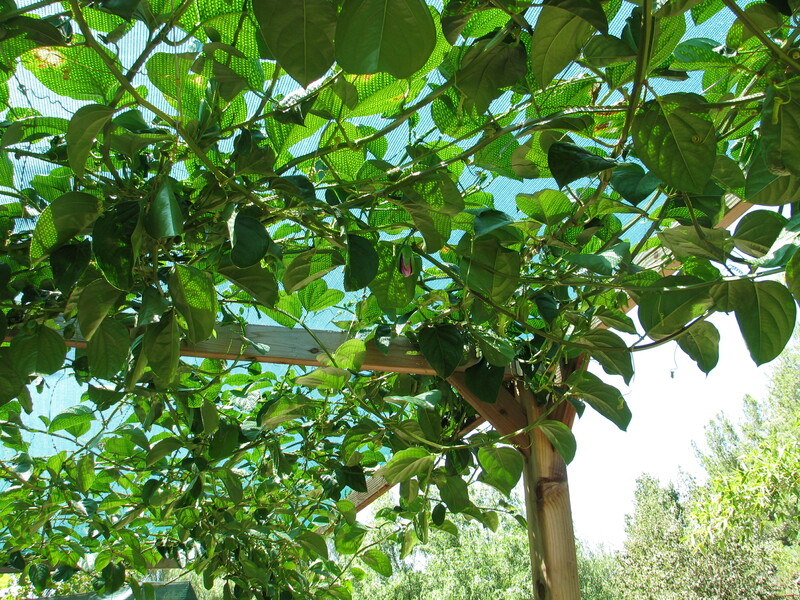 Passionfruit vines work beautifully on overhead trellises. Wire is strung the length of the trellis, with shade cloth over the top. The vines don’t need any help to fill up the gaps. 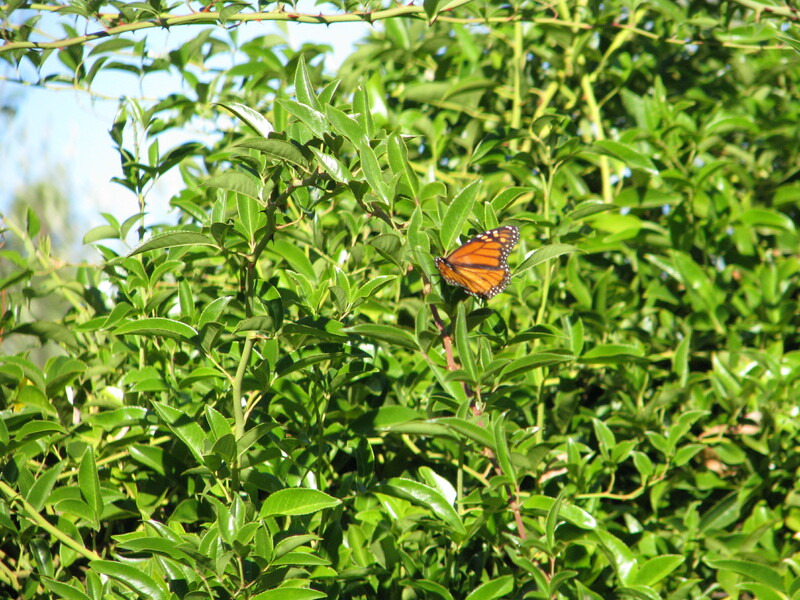 Passionvines are evergreen perennials with rampant growth and provide good crops of heavenly-smelling nutritious fruit, as well as being the host plant to the Gulf Fritillary caterpillar. Even the perennial scarlet or golden runner bean would provide you with food and flowers for about six years. 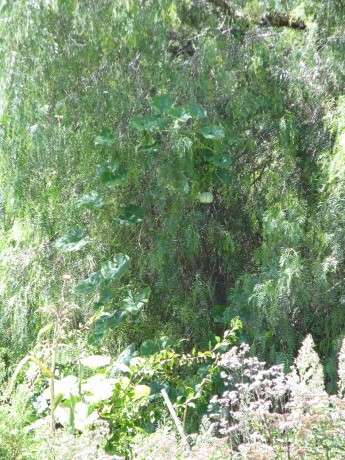 This curly willow trellis we put up in late spring and planted squash along both sides. The squash love the trellis, and the trellis adds a nice touch to the pathway. 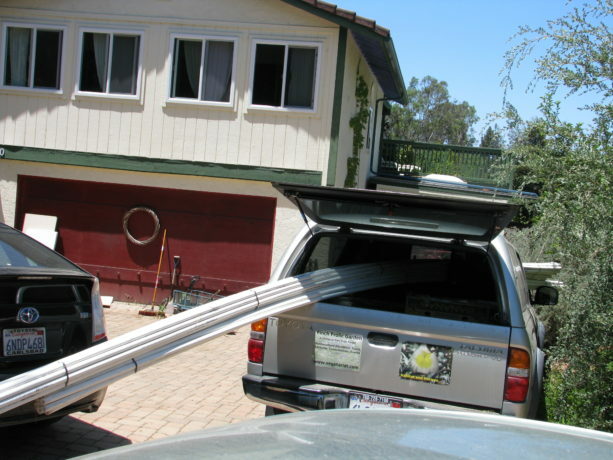 Do you have a cement porch or patio where the sun reflects heat and brightness into your house in the summer? Cover it with a simple trellis, sturdy enough to hold vines. 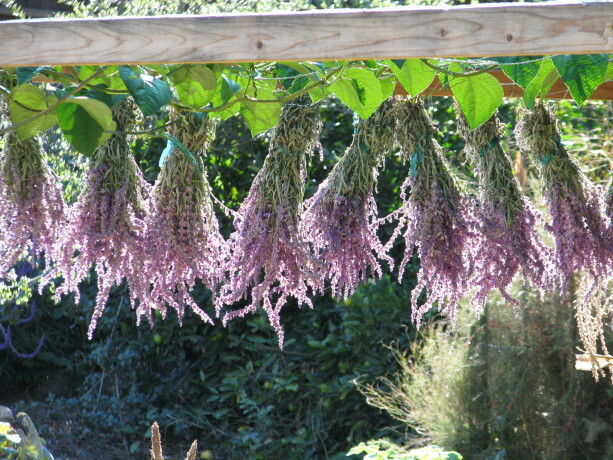 There are many ornamentals that would work (wisteria, trumpet vine, virgin’s bower, morning glory, etc. ), but think about passionfruit, kiwi or grapes. Outside a west-facing wall is a perfect place for a planted trellis, that will help cool that side of the house during the summer. The sides of sheds can be used vertically, either with simple wire that can be removed later or with wooden lath (preferably recycled). Strange fruit in this lime tree? Yes! Its a zuchino rampicante vine. 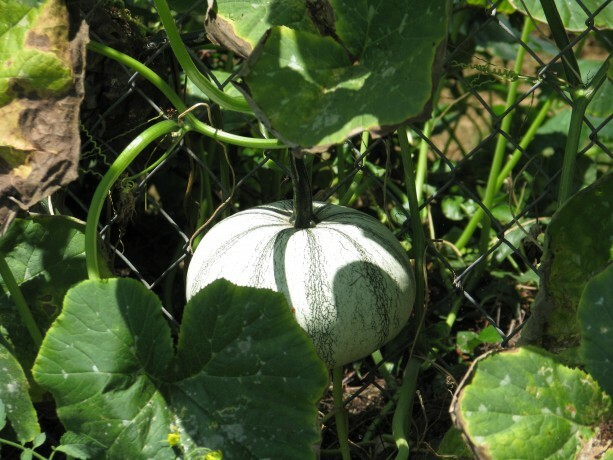 This heirloom zucchini can be eaten green, or if allowed to age will harden into a uniquely-shaped winter squash. If you have existing trees, use them as vertical space. One faction of a plant guild is a vine. Vines act as groundcover, shading the soil and retaining moisture while producing mulch. 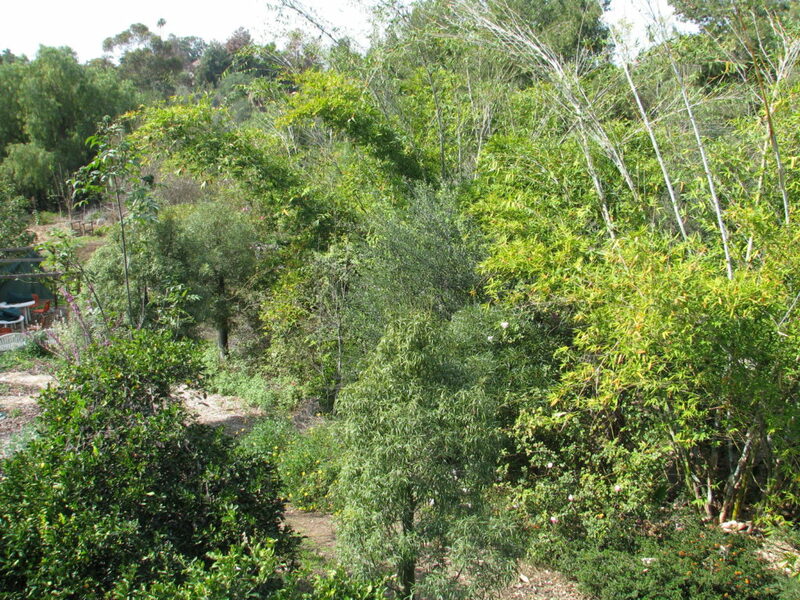 Vines also can grow up trees and help shade their trunks from weather extremes. 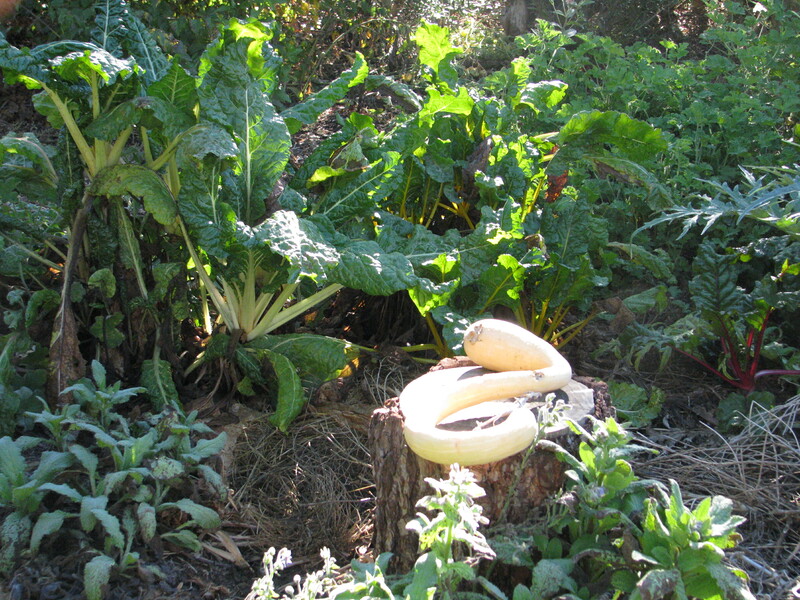 Meanwhile the fruit and vegetables are off the ground and won’t suffer the predation by animals or ground insects that it may normally receive. 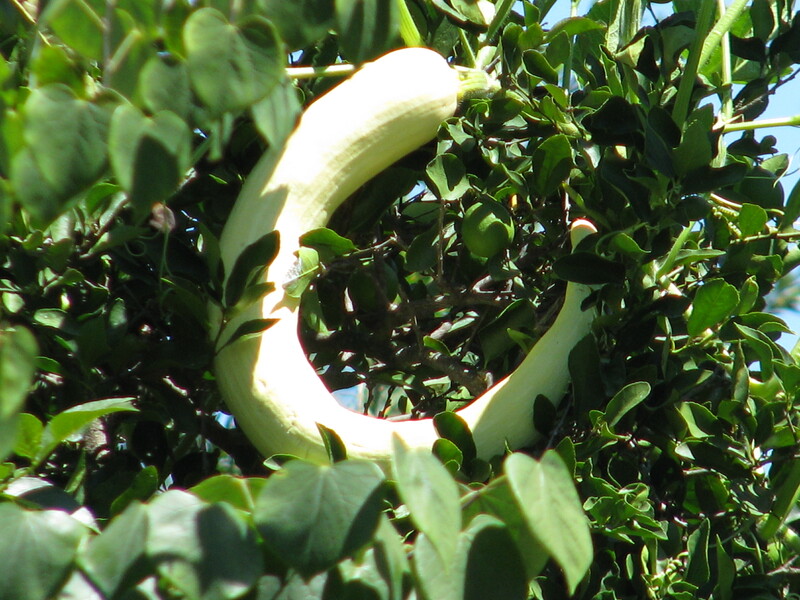 Plus, it is fun to see squash up in a tree. Um… that is definately a pepper tree. But what is hanging in it? 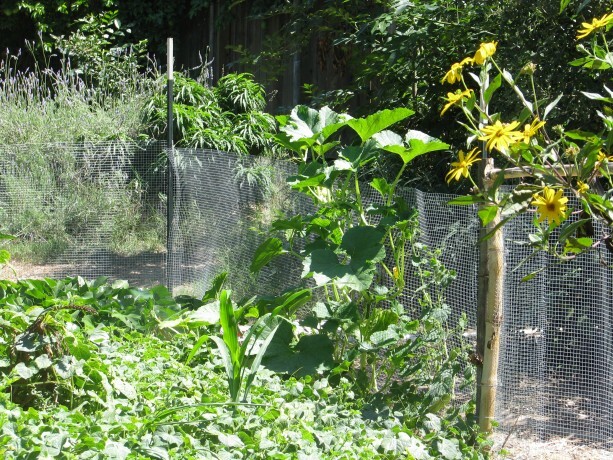 A small fence around your kitchen garden is inexpensive, recyclable, keeps nibbling critters out, and can double the size of your growing space. T-posts and hardware cloth around the kitchen garden adds so much more growing space, and keeps critters out. 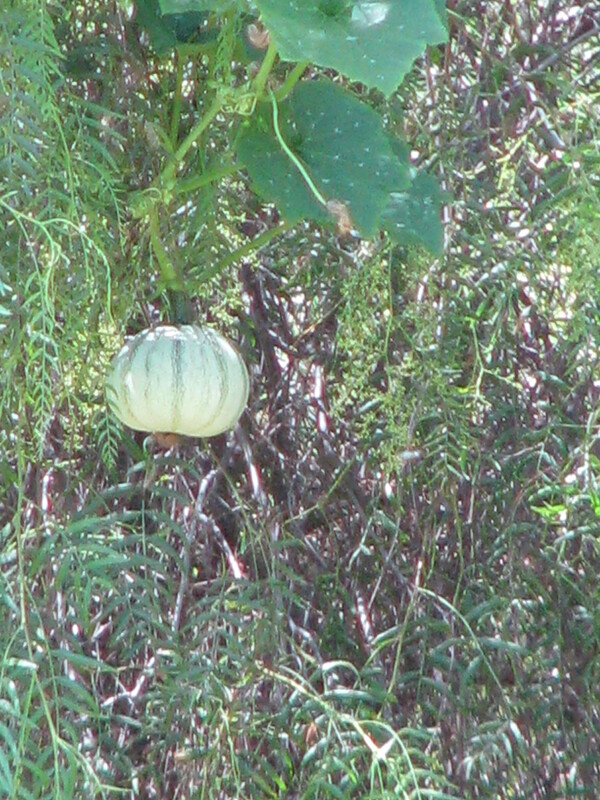 Delicata squash is enjoying the late summer sun. One project that I’d like to do this winter (just one? Ha!) is to nail up old rain guttering on the outside of my little shed and make a small natural pond at the base. 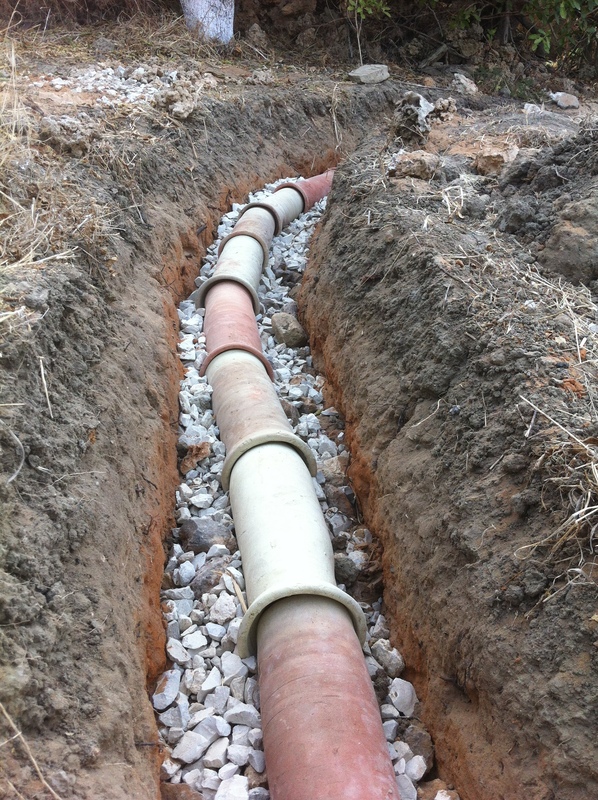 I’d plant the gutters heavily with strawberries, and maybe greens, and then install a pump that circulated water from the pond up to and through the gutters. The water would then empty back into the pond. The fish and plants in the pond would be fed and happy, the plants in the gutters would be watered and fertilized, and I’d have unnibbled strawberries that were easy to pick, as well as repurposing the old gutters. Please choose only organic, and if possible, heirloom seeds. It is so important to not poison the wildlife and ourselves with chemicals and plants whose DNAs have been tampered with to withstand more chemicals. I buy from Baker Creek (the catalog is to die for. ), Seeds of Change, organics from Botanical Interests , from organic seed savers and from Peaceful Valley Organics (which have terrific prices on high-quality bare root plants such as strawberries!). More squash helping shade the trunks and the soil around a nectarine. So when planning your next season’s garden, don’t just think outside of the box, but think of growing up the sides as well! 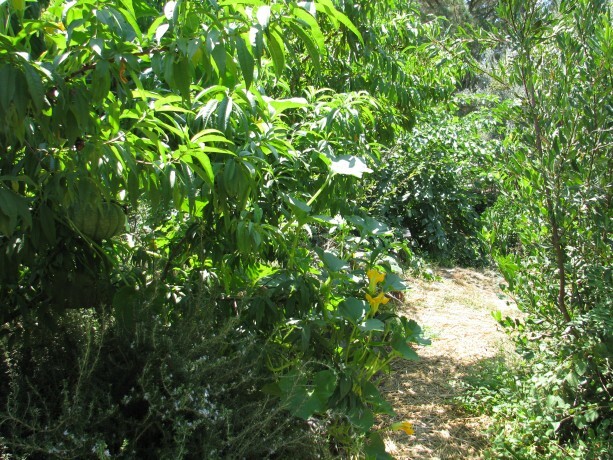 Thanks to my daughter Miranda, our permaculture food forest habitat Finch Frolic Garden has a Facebook page. Miranda steadily feeds information onto the site, mostly about the creatures she’s discovering that have recently been attracted to our property. Lizards, chickens, web spinners and much more. If you are a Facebook aficionado, consider giving us a visit and ‘liking’ our page. Thanks! The girls helping prepare the soil before planting. 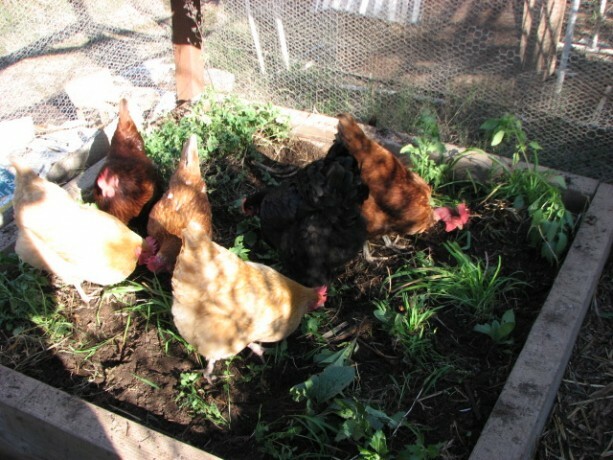 Chickens are primarily bug eaters who also snack on greens. 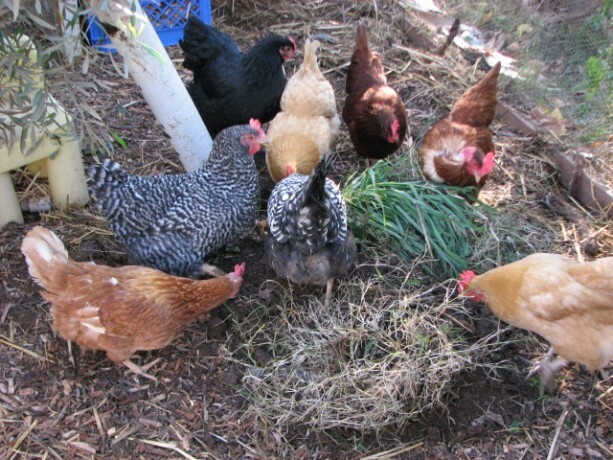 Feeding hens grains began with the industrialization of agriculture. No one cutting grain with a hand scythe would spend all that time and energy to feed hens. My hens live in the Fowl Fortress, to protect them from coyotes and hawks (our hawks won’t be able to carry one away but they could tear them up pretty badly). After losing Chickpea to a coyote while we were only so many yards away made me eliminate any open foraging time for the girls. This wasn’t healthy for them. I haven’t invested in a solar electric fence yet, to make a ‘day’ coop for them to forage in relative safety, but that may be on my investment list for the new year. The largest problem is poor design in the garden, which I’m trying to remedy as easily and inexpensively as possible. I didn’t know how to fit in chickens, or where the garden was going when it began nearly three years ago. I have weedy areas, and I have chickens. To bring them together safely is the problem. Sometimes we bring the hens into the fenced yard with our 100-pound African spur thigh tortoise (Gammera); however, that yard is also where some of our cats live. We’re not sure if Moose, Chester and Cody would behave themselves around hens, so unless we prevent the cats from leaving the house for the day, then we can’t carry the hens into this grassy yard to graze. 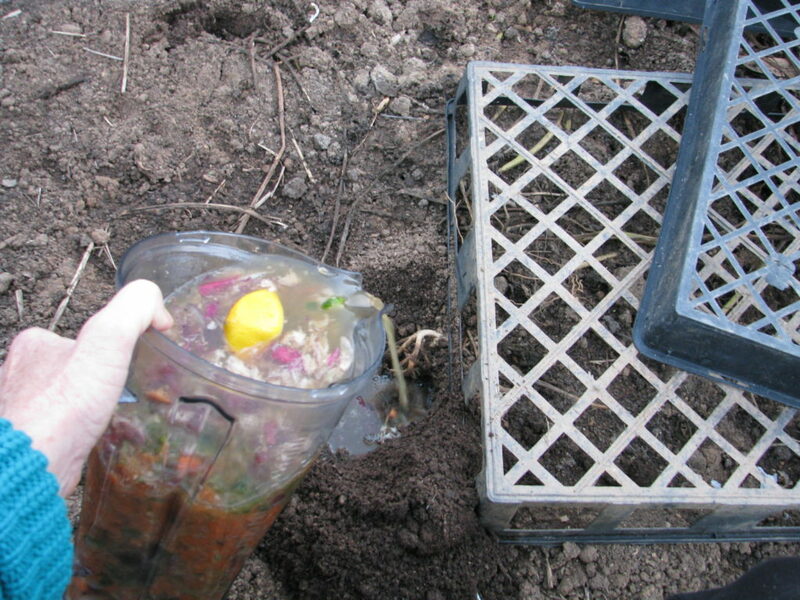 Inside the Fowl Fortress there is a layer of muck composed of old straw, the hard bits of veggies and fruit fed to the hens, old scratch and lots of chicken poo, made into an anaerobic muck by recent rains. Once turned up we discovered lots of the grain had sprouted, which the girls sucked up like noodles. This muck was also turning the hard ground below into prime soil. Why couldn’t we use this muck in a more productive manner? If I couldn’t bring the hens to the garden, then I thought I’d bring the garden to them. Inside the Fowl Fortress I propped up four big boards in a square, then filled it with some of the rotting straw and muck from the coop. 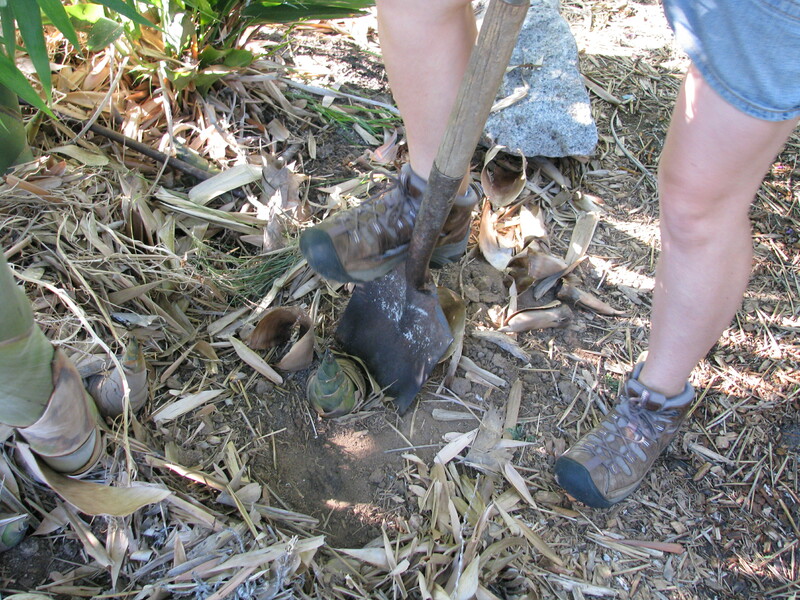 I topped it with Bermuda grass – laden soil from one of my raised beds. This was the bed, in fact, where I composted in place for the past year. 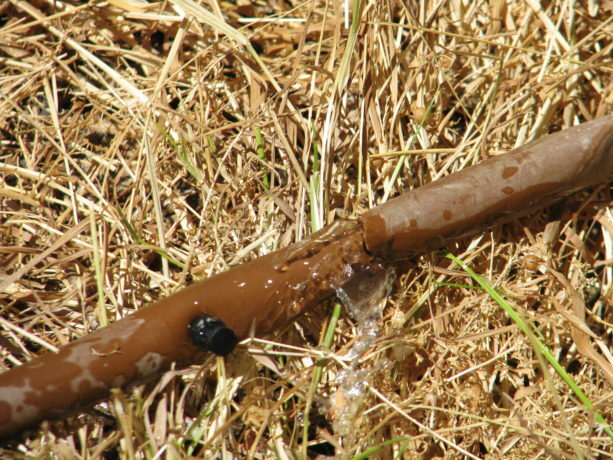 What rich, chocolate-colored, worm-laden soil! If not for the invasive grass it would be perfect. 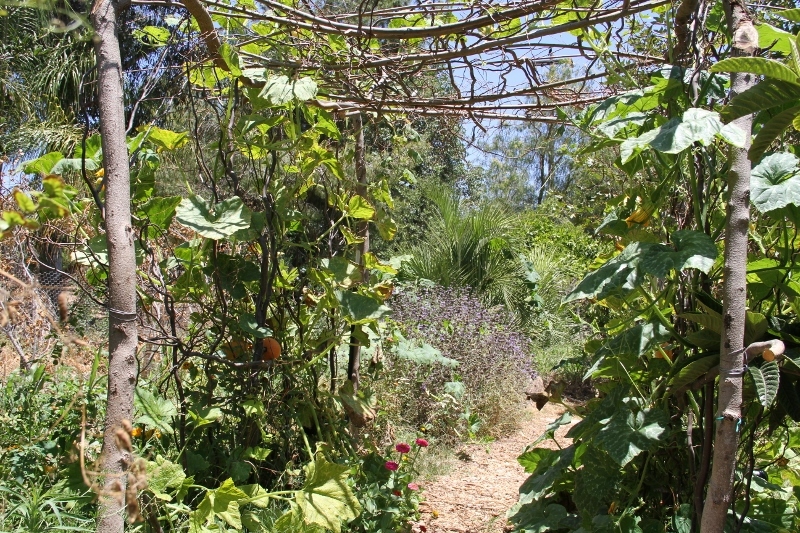 In this new garden, along with the Bermuda grass, my daughter and I planted oregano we divided from one of our plants, nettles, borage, some other kind of grass weeds that had sprung up after our Fall rain, plus we scattered corn and mixed organic grains which we feed the hens and pressed the seed into the ground. The hens can graze, but can’t uproot the plants. Miranda wired together a bamboo lid out of scrap pieces. The idea is that the plants can grow up through the lattice of the bamboo lid and the hens can stand on it and eat greens. Oregano is a good medicinal herb, as are nettles, which reputedly encourage egg laying. 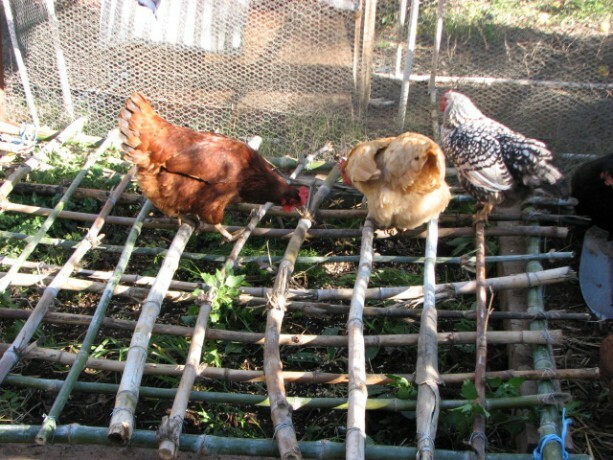 This is by no means a permanent solution, but until I find the right design that keeps healthy, safe hens and eliminates weeds without a lot of work, then a chicken garden and weed-tossing is the way to go. 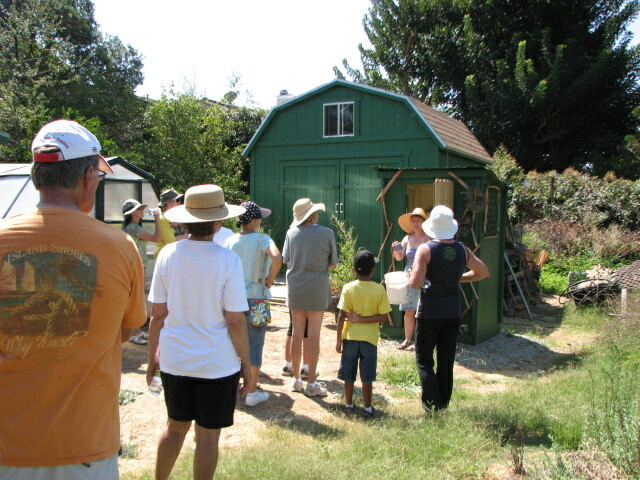 This photo was taken just as work was begun on transforming the property into a garden, in February, 2011. This photo was taken last Thursday, Oct. 31, 2013, from the same location. 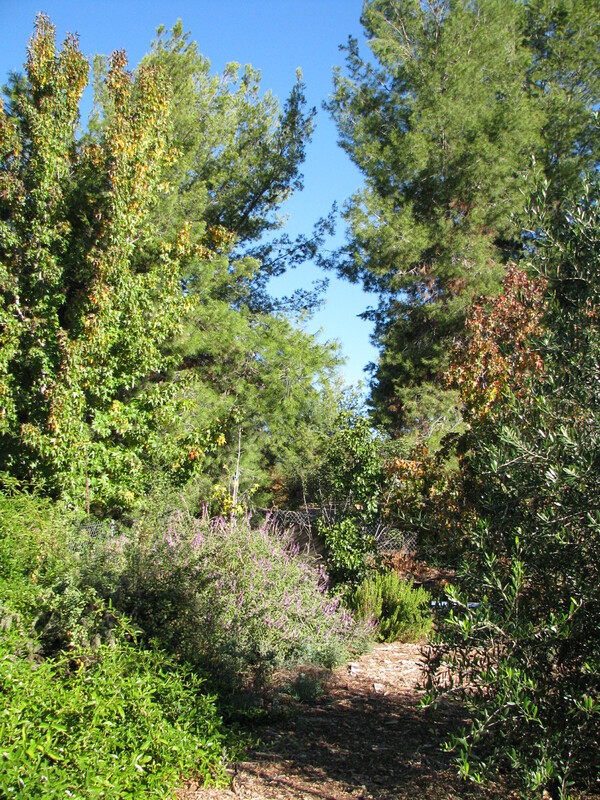 This view may look weedy, especially in the early morning light on this brilliant Halloween morning. What you are seeing is the first bog, which is the green spot in the foreground. The dirt area is the overflow, if torrential rains ever come again. To the left, the tall bushes constitute the withy hide, and to the left is the big pond, although you have to take my word for it. 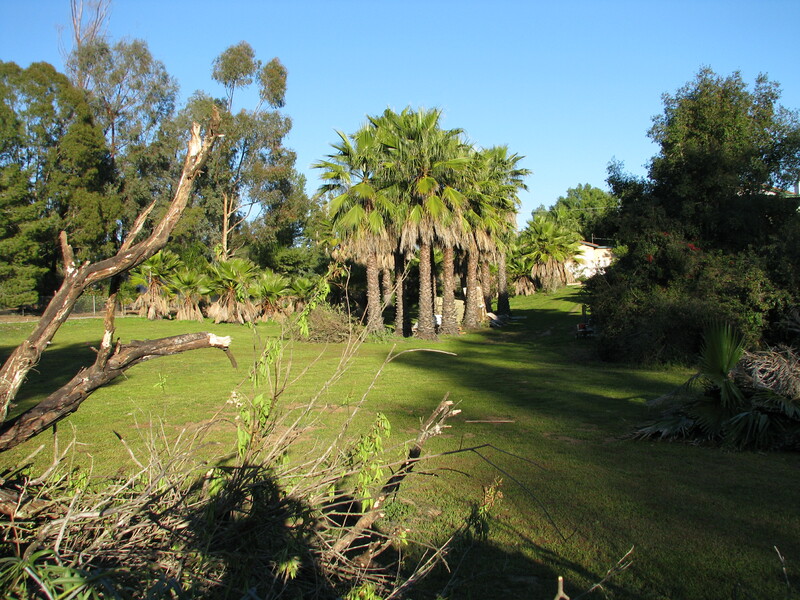 Tall bamboo arches over the stumps of the palm trees in the above photo, which are trellises for roses and other vines. 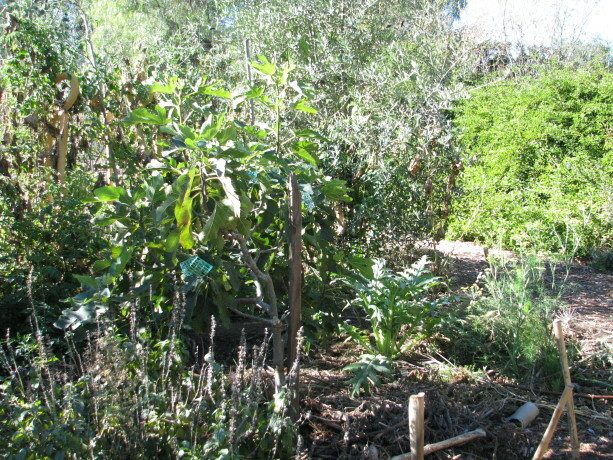 A nectarine branch is in the right foreground. The tall flowering plants are a native called fleabane. They reseed readily, and I allow them to because of several reasons. They grow five to six feet tall and help shade smaller trees and plants against the harsh summer sun, protecting them from sun scald. They also die off in the winter, making good hugelkultur material. The purple flowers, which are in the above photo now turning into fuzzy seed clumps, are attractive. 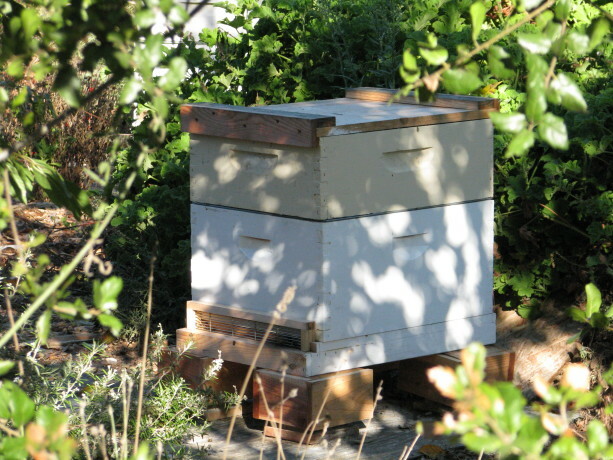 The most important thing though is that they are excellent hosts for native insects of all kinds. Ladybugs, lacewings, spiders, and hundreds of tiny wasps and flies, many of which are parasitic, all love these flowers. All summer long they are alive with life. 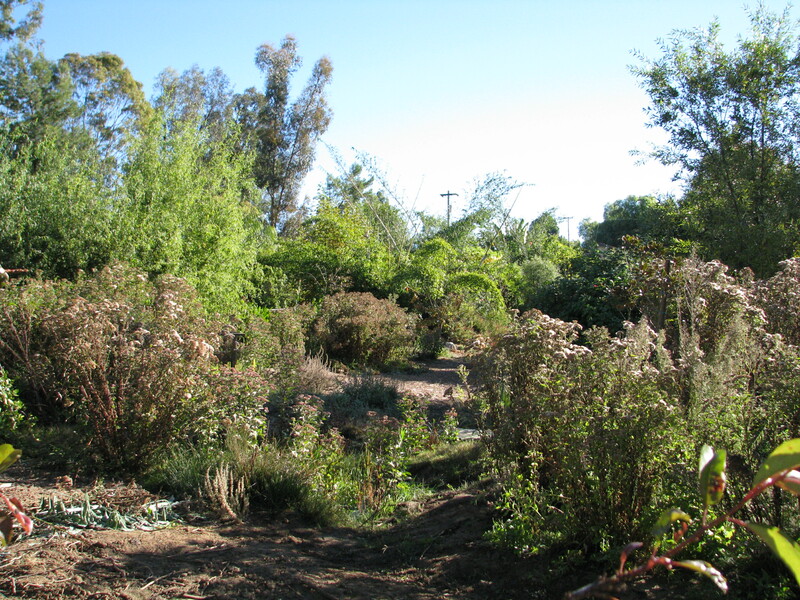 Inviting in the native pollinators, and growing a polyculture garden, is the first line of defense in growing naturally. 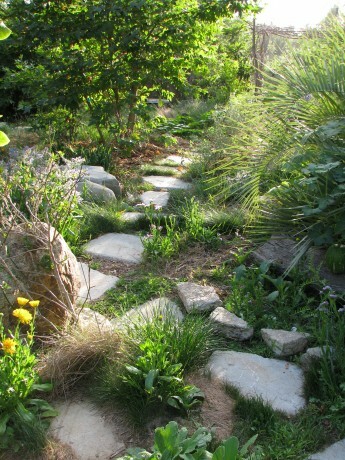 Allowing nature to define parts of your garden leads to happy surprises and lots of help from unexpected friends, such as bugs, birds and lizards. This kind of garden is endlessly interesting, with new things to study every day. The following photos were all taken the same brilliant morning, Oct. 31, 2013. Here in San Diego county we were having what is called a Santa Ana, where warm, dry winds from the desert blow westward, as opposed to the more humid eastward flow of air from the ocean that we normally have. 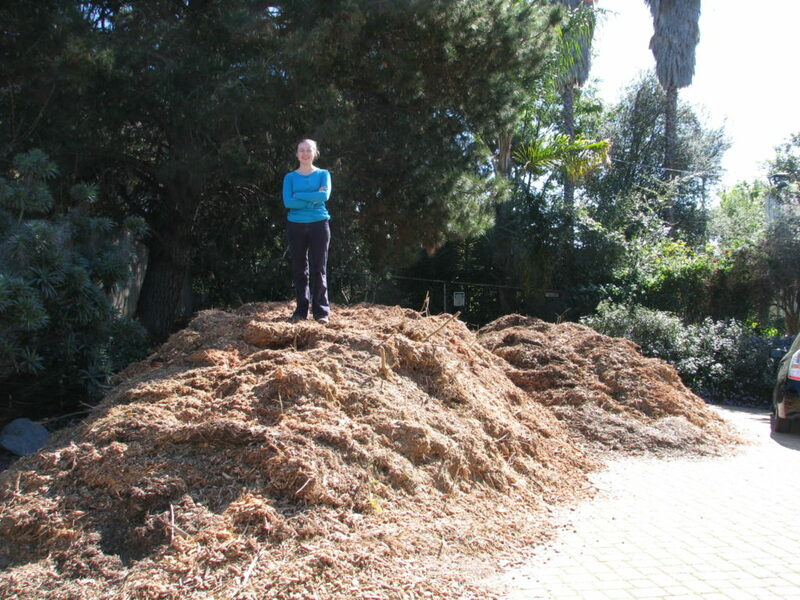 Santa Anas can bring heavy winds and make tinder-dry weedy hills a fire hazard, but this year we’ve been lucky and no major fires have happened. We even had almost 3/4 ” of rain, last week, which is practically unheard of for October. The warm Autumn sunshine was intense and lovely, and I had to take photos even though the light was too strong for good ones. We went up on the roof to view these three greater egrets perched in our trees over the pond. Being on the roof is an education. 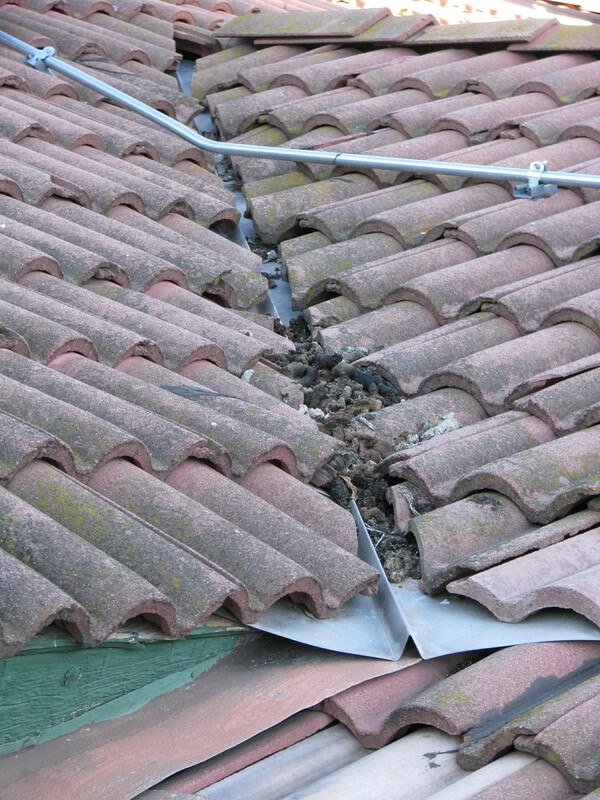 Here is lots of racoon poo between the tiles. Why?! We don’t have dramatic Fall colors here, but the subtle Autumn hues of leaves is lovely. We still have Monarch butterflies. 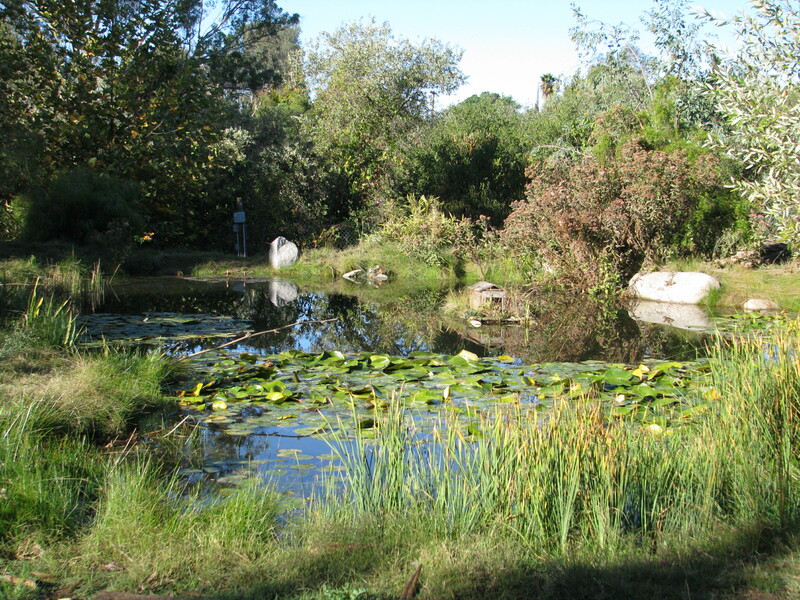 The big pond in early morning light. A zuchianno rampicante reclining on a stump. (Its a squash!). Morning sun through a Fall-leaved sycamore. Beautiful. Mexican bush sage hanging up to dry. 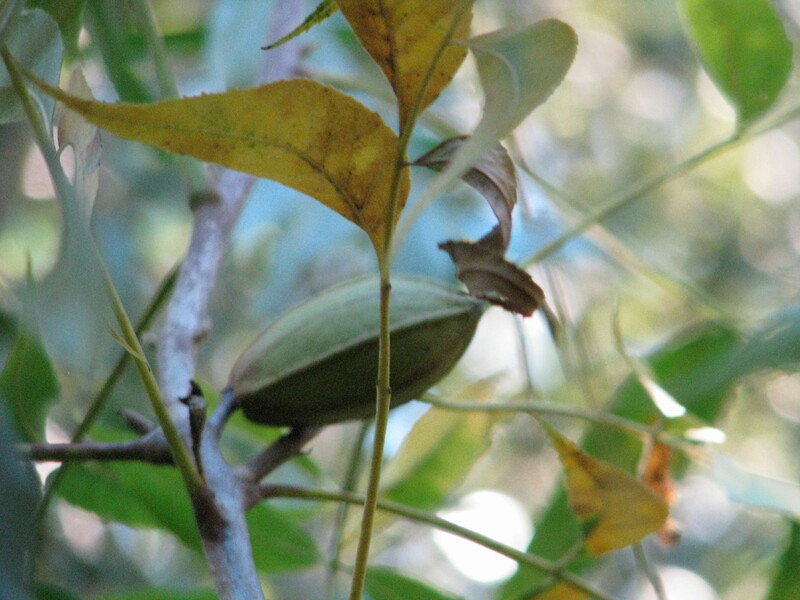 Our little pecan tree put on about six this year! Next year, tons! Ceder waxwings (my favorite bird) in the big palm. 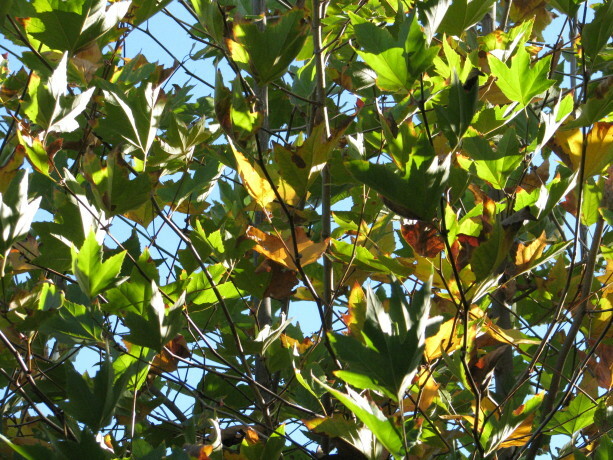 The liquidambers, also known as sweet gums, are just beginning to turn color. Lots of deciduous trees means lots of leaf mulch, and more warmth reaching the ground during the winter. 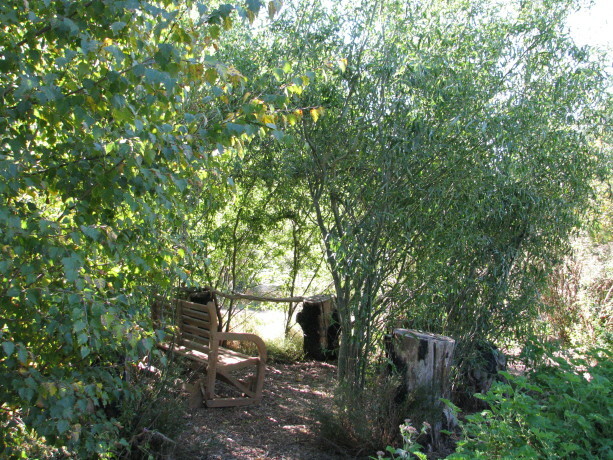 The entrance to the withy hide, with the pond in the distance. The Mission fig,with artichoke, anise and sage.. 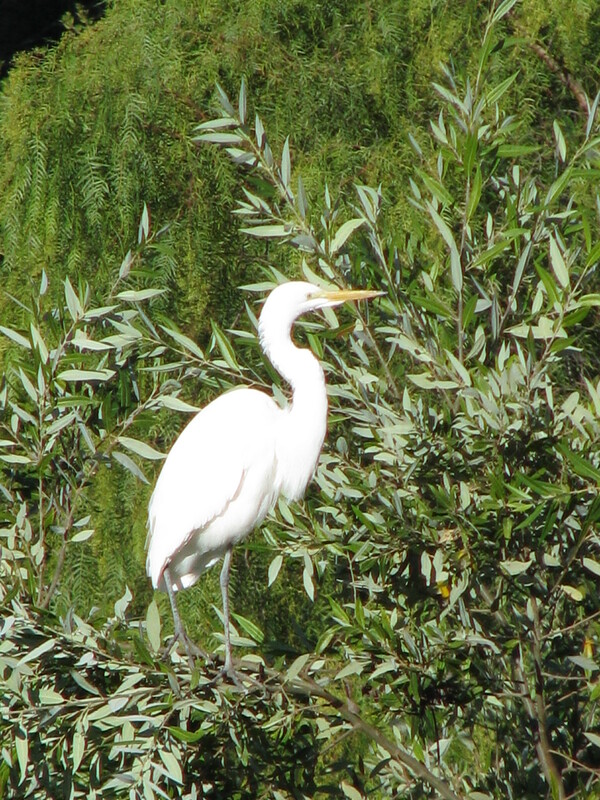 Greater egret enjoying the sun. Before you cry, “Imposter!”, let me assure you that I have authorization to be here. Mostly. I happen to be Diane’s daughter Miranda, guestblogging and wordsmithing for you today. You might recognize my powdery feet or recollect me when keeping company with chickens (or from diverse other adventures). 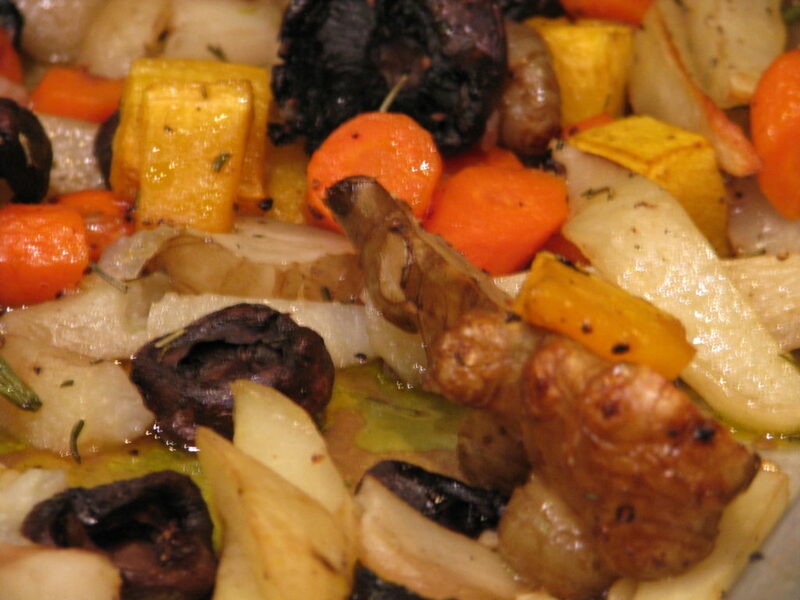 As much as I enjoying rolling in dust and home decorating with hens, today I’m here to talk about an unusual topic for Vegetariat – food. The handy rhyme isn’t the only reason I’m sometimes known as Miranda the Panda – I also have a great partiality for a bit of bamboo, much like the vegetarian carnivore from whom I draw my catchy moniker. Luckily, we happen to have a fair bit of the stuff around Finch Frolic these days (bamboo, not pandas). 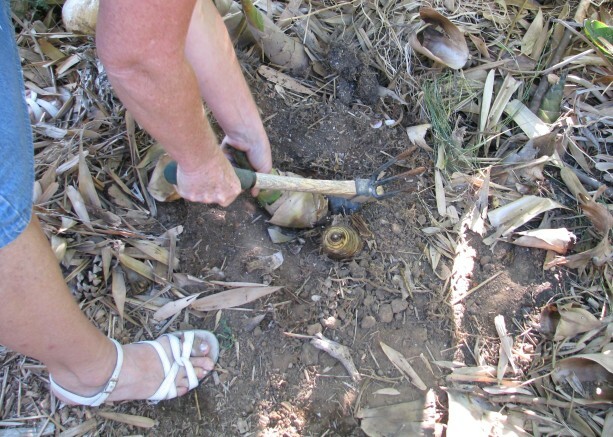 Bamboo shoots are a common – and delicious! 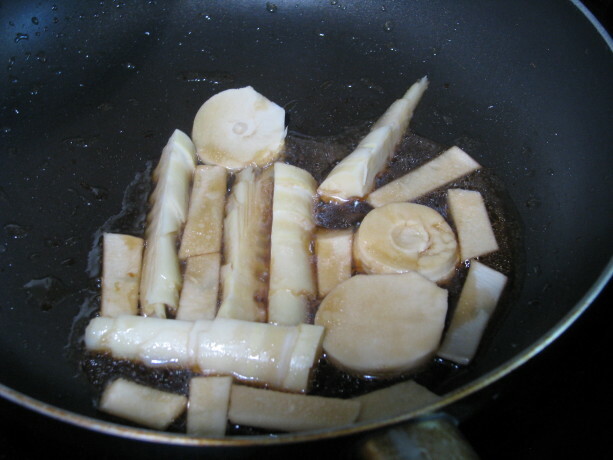 – component of Asian cuisines, and bamboo has been used for many culinary purposes, such as flavoring rice, wherever it grows. 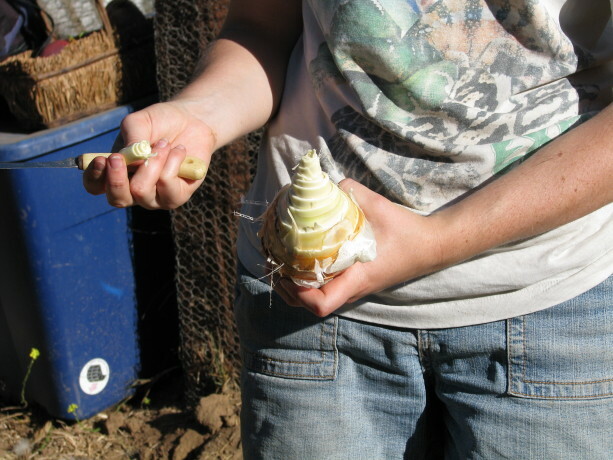 During this past summer, I was overcome with the need to find more things to eat on the property and began a foray into harvesting our own bamboo shoots. Before I stepped outdoors and started gnawing on the nearest clump, I had to be sure that our bamboo is an edible variety, and hopefully a tasty edible variety. 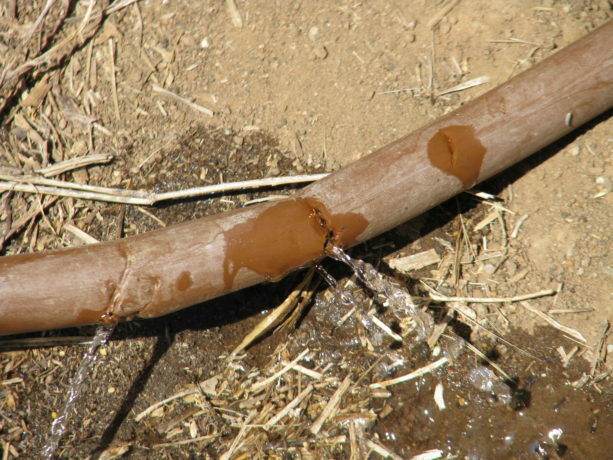 You need the scientific name of your bamboo for that, but once we ferreted out ours (Bambusa beecheyana), it was easy to find notation of its edibility and delectability online. One helpful and extensive listing is on Guadua Bamboo. Happily, there is a large number of edible and tasty bamboo species. Proof of mange-ability in hand, the next obstacle was divining the best way to get bamboo shoots from the ground to my mouth. 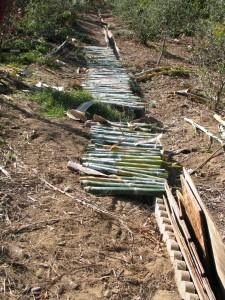 Harvesting can be more or less of a challenge, depending on what variety of bamboo one has and how it’s established (e.g., moisture and soil conditions, obstacles like stones around it). To harvest shoots, it’s best to pick fat green ones poking no more than a foot above the ground. You want to catch them before they get too woody, but old enough to have a bit of meat on them, so to speak. The shoot is mostly leaf (tightly layered sheaths), so bulkier shoots are more rewarding. Removing our bamboo from the ground and its parent plant turned out to be on the more side of challenging. Miranda and Diane bust out the Finch Frolic arsenal on the recalcitrant shoot. First, the inimitable spade is set to the task. Legs weary and spade abandoned, the small sickle saw is recruited, to little effect. Diane had just returned home and gleefully plunged into the fray, skirt, white sandals and all. Finally, Diane wades into battle with the winning implement. 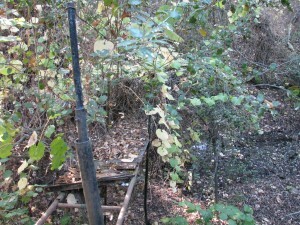 The shoot, freed from the earth and its parent plant. 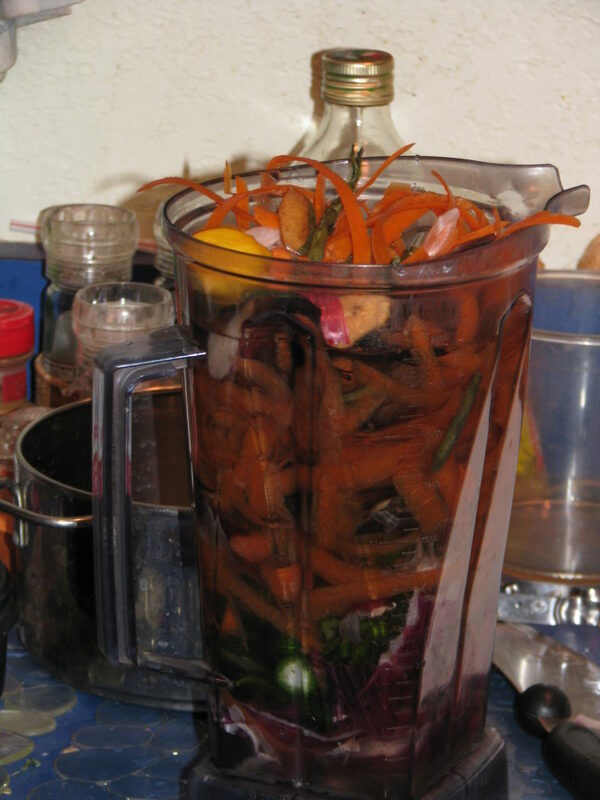 Once we finally achieved success, processing could begin! It is somewhat tiresome to strip a shoot down to the edible white core, because the leaves cling so tightly and are fibrous. 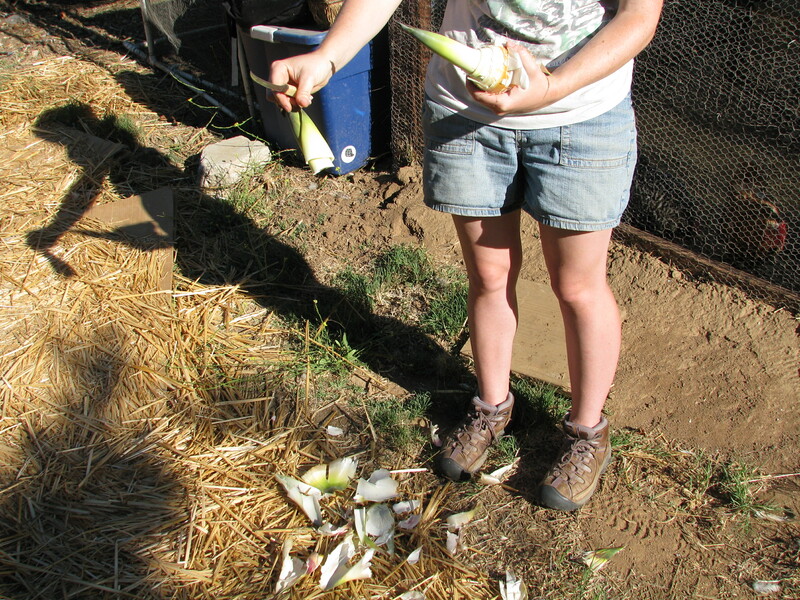 It’s like shucking the most stubborn ear of corn in the world. It’s good to slit the tougher outer leaves with a very sharp knife and peel them away. 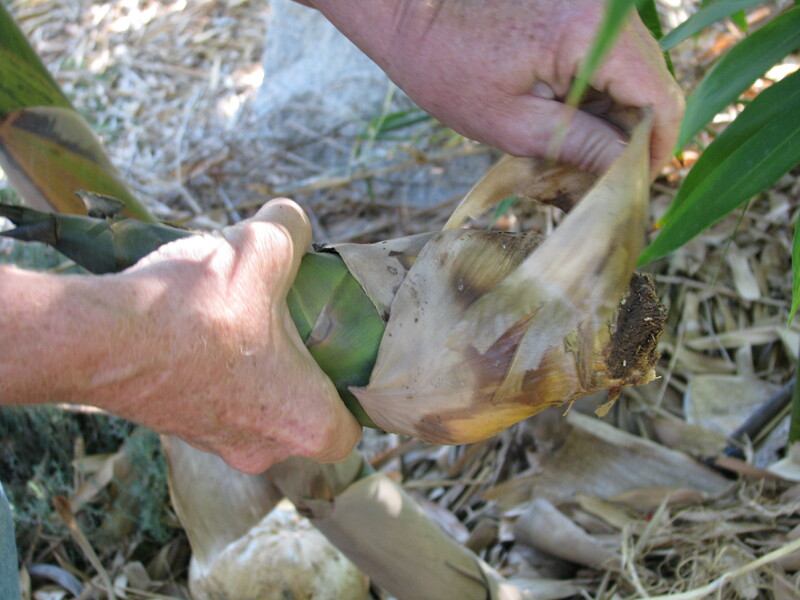 Slitting the fibrous outer leaves with a filet knife. 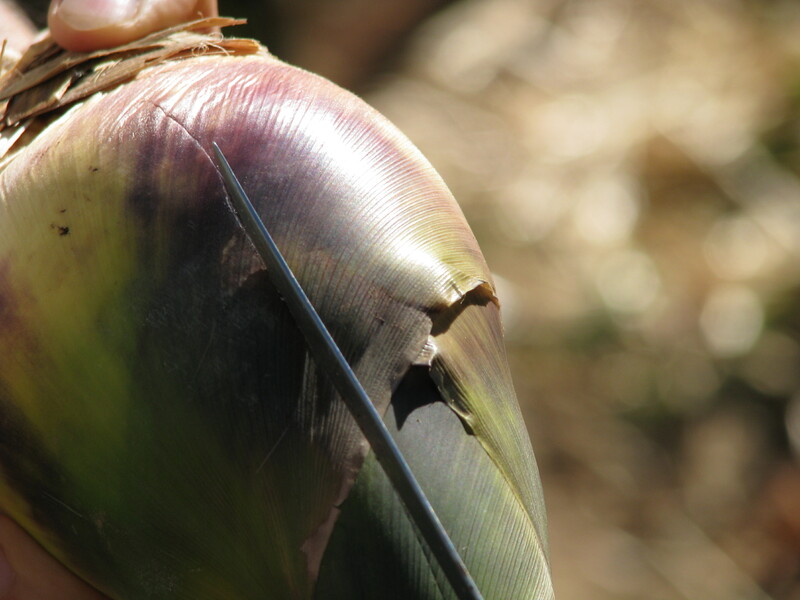 The inner leaves come away more easily – rather like the layers of canned hearts-of-palm – as you get closer to the heart of the bamboo shoot. 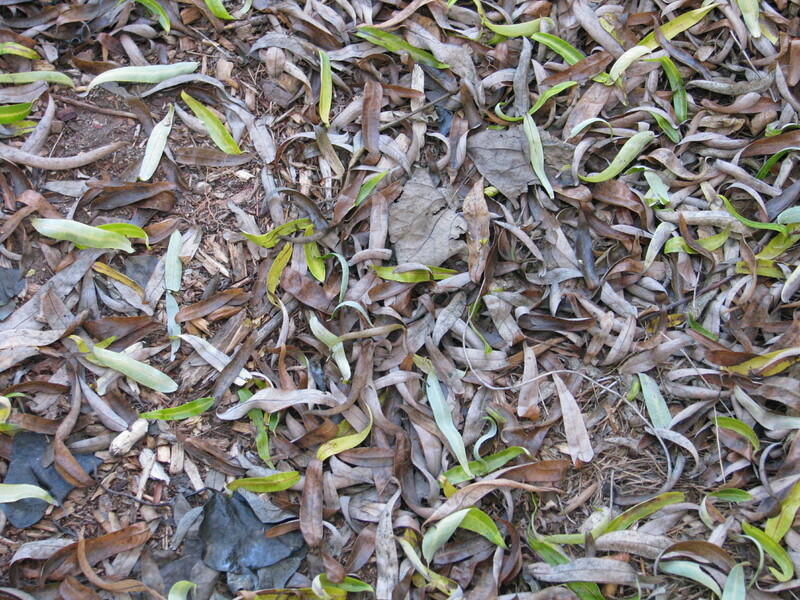 The innermost leaves are basically fetal, and so are edible because they haven’t gotten tough yet. They make the tip of your shoot look hairy. Many layers of increasingly tender leaves. A peeled bamboo shoot can be cut up in whatever way the chef desires. 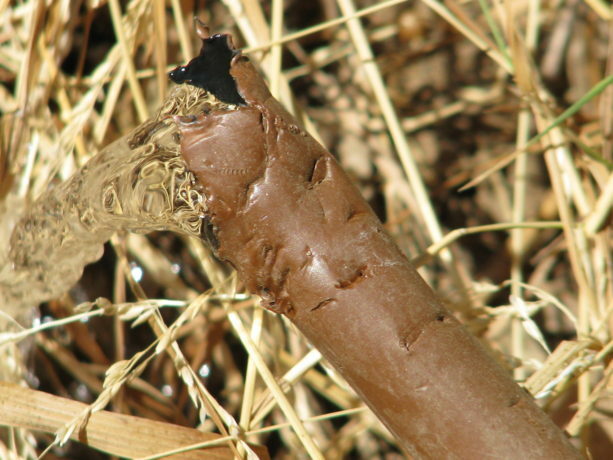 The shoot grows more fibrous towards the base, where there is probably some inedible hard material. My current rule of thumbs-carefully-tucked-away is if a sharp knife can pretty easily get through it, it’ll be fine to eat. A shoot cut in three different ways. 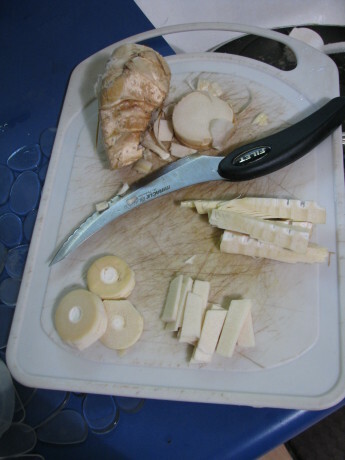 The material behind the knife (upper left) is too fibrous to eat. You just have to boil your slices before cooking and consumption because they contain a mild toxin that dissipates with boiling. The first time, we tried boiling in lightly salted water for only 30 minutes, and while the shoots were tender and not really bitter, they left a teeny tingling sensation in our mouths, like stir-fried Pop Rocks. 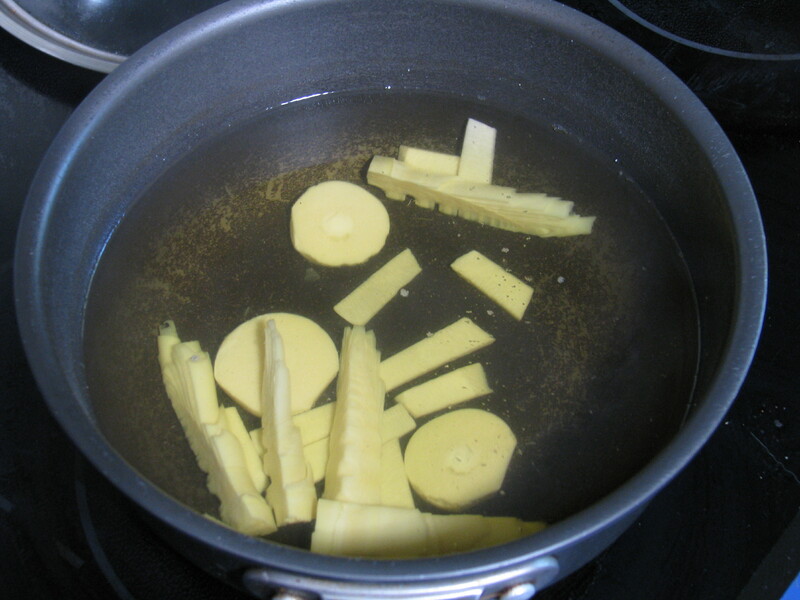 The last time I cooked them, I boiled them for a whole 50 min. to much more satisfactory, un-tingly results. Bamboo is delicious and a lot of fun (in a somewhat laborious way) to harvest. 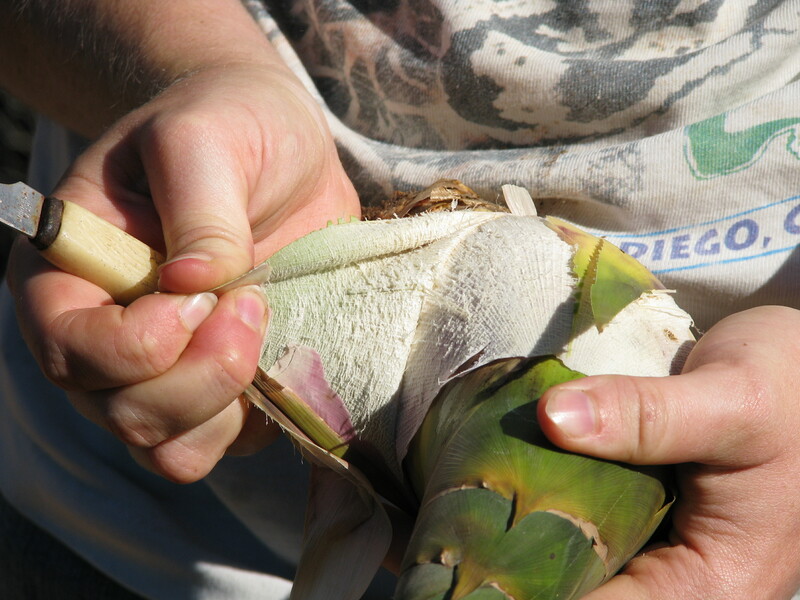 The beauty of harvesting your own bamboo shoots is that you are saving yourself a trip to specialty markets and controlling your bamboo’s growth at the same time! So that’s another thing going on here at FFG. Thanks for wandering the bamboo lane with me. 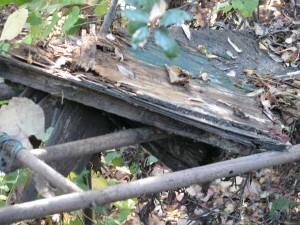 Rotten plywood and downed branches cover the old bridge. 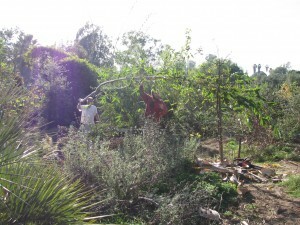 Part of a sustainable garden is the growing of building materials. 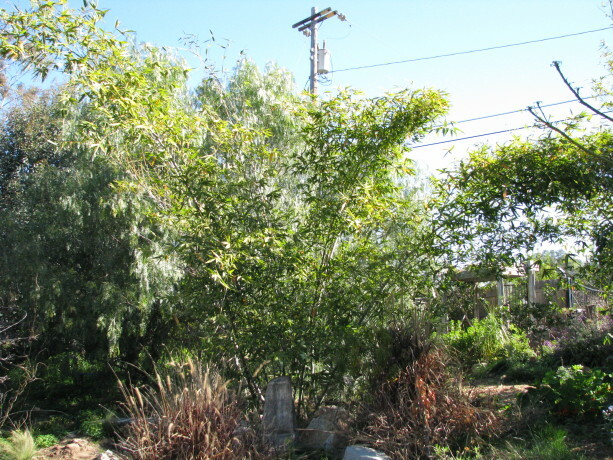 If you can’t have a wood lot, then temperature permitting you can grow clumping bamboo. You can grow ‘running’ bamboo if you’d like, but it would be wise to keep it contained in pots or you’ll end up with a major headache such as I had last January trying to remove it. The bamboo in my yard has happily grown into giant plants with wonderfully tall, strong shoots that are ready to harvest. I have several projects in mind, but the most fun and appealing has been the refurbishing of an old bridge. All the old stuff had to be stripped off the framework. 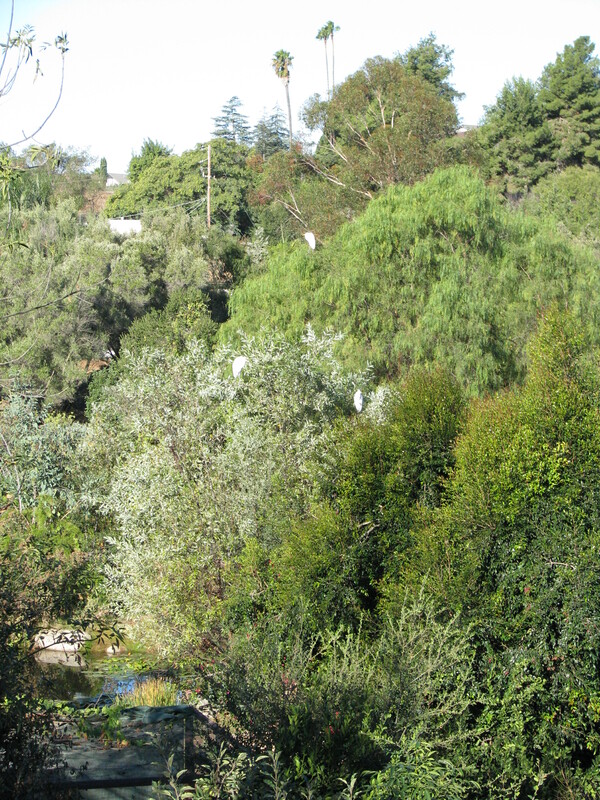 The bridge was sprawling across the barranca when we moved here 13 years ago. 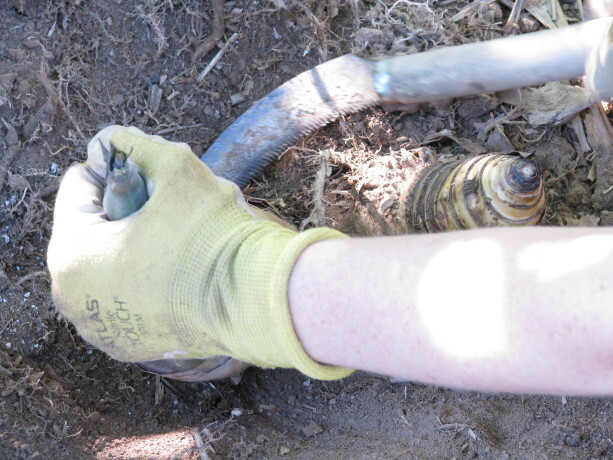 Although the pipes screwed together were actually solid enough, the plywood, tar paper and carpeting that made up the walkway was well on its way to rot. The metal frame looked bad but actually was stable. 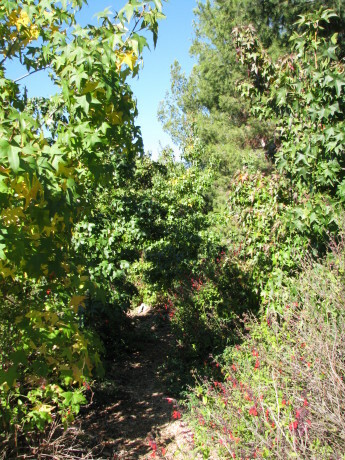 The other side of the barranca is home to poison oak, and getting to the bridge was difficult as erosion diminished the hillside. 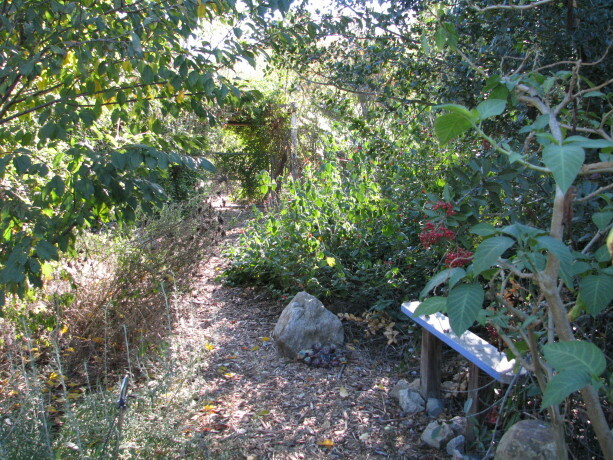 Now through permaculture, the erosion has been eliminated and thanks to Roger Boddaert and his crew there is a wonderful walkway down to the bridge. 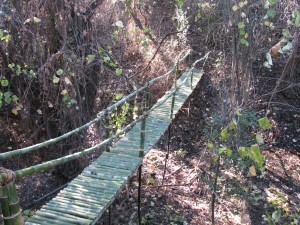 However, the bridge was unusable and had broken branches hanging over it. 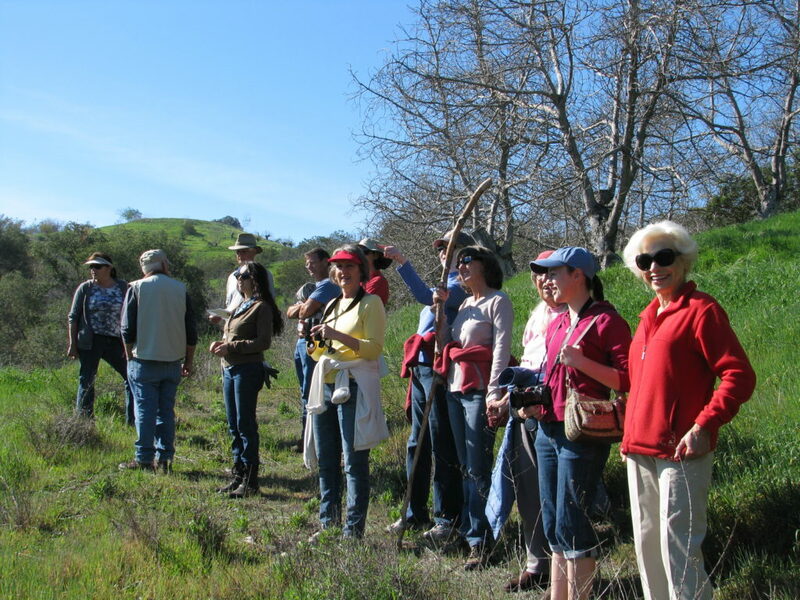 The barranca itself is very beautiful and a wonderful bird-watching location, so revitalizing the bridge with natural building materials would turn the eyesore into a beautiful addition to the gardens. 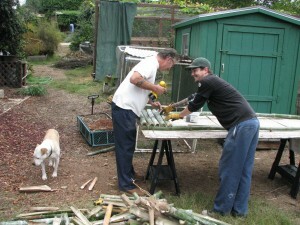 Jacob and Steve harvesting bamboo. Jacob Hatch and his father-in-law Steve have had the task of harvesting, splitting and working with the bamboo.That is because, as I’ve admitted freely in past posts that my building abilities rate right up there with my ability to cut hair, with about the same disasterous results. I can see what I want in my mind, but my hands aren’t paying attention. First Jacob and Steve had to clear the bridge of the tar paper and rotted plywood and test the metal pieces for strength. Working from a library book, they harvested the heavy water-laden shoots. After cutting the pieces to the correct width for the bridge, they used a sharpened old knife and a rubber mallet to split the stalks. 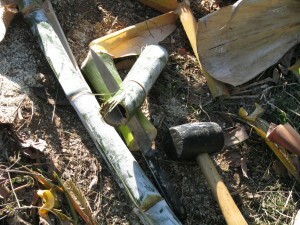 A rubber mallet and sharpened knife were all that was needed to split the bamboo. 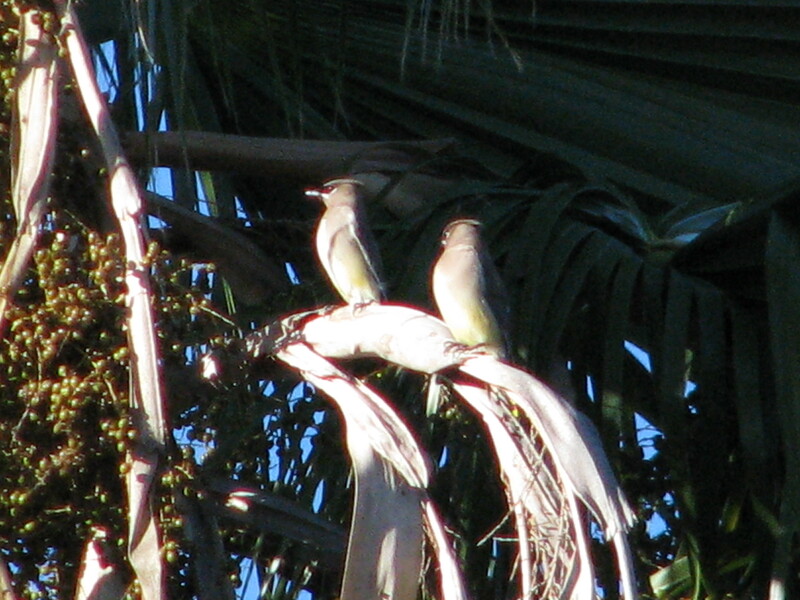 UnfortunatelyInside the sheaths there was a black fuzz that caused both of them to itch. Steve and a third helper Jake screwed the horizontal pieces onto the long supports. Steve and Jake screw bamboo onto the frame while Sophie looks on. 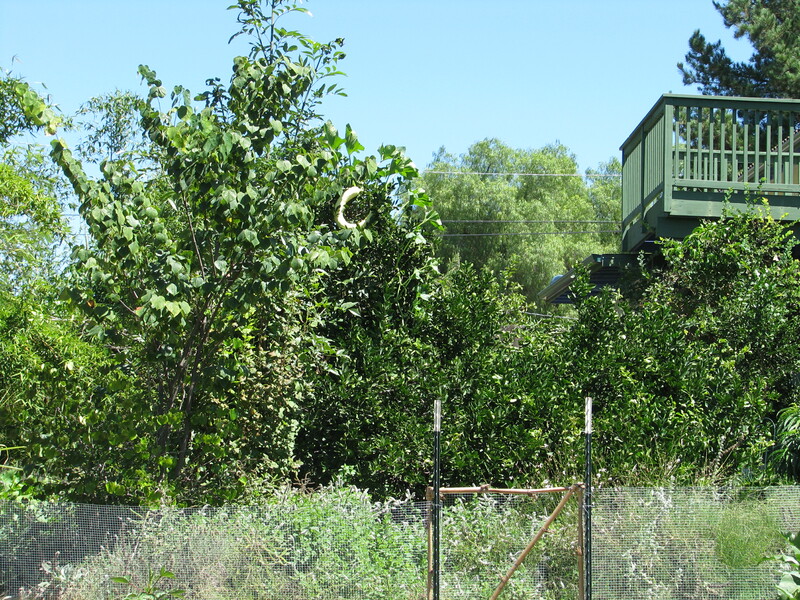 They built sections, then carried them down and installed them on the existing bridge poles, with the long pieces of bamboo fitting outside of and hiding the metal. Bamboo was then wired on to the uprights, and a railing was installed. Finally the ends were tied with sisal rope. This added strength as well as beauty to the finished work. 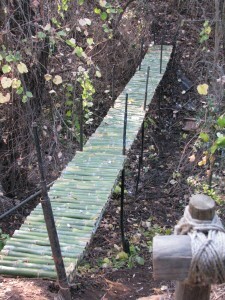 Bamboo railings in place with sisal ties and wire. The bamboo is still green; as it ages it will cure. 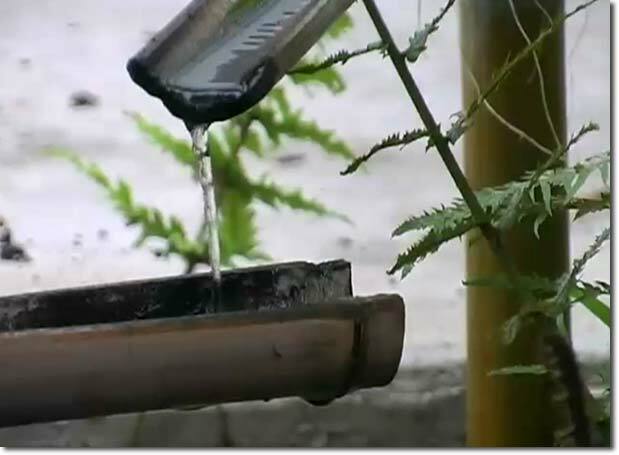 Beads of oil will form on the top and the oil will be rubbed into the bamboo to strengthen it even more as it hardens and dries. Right now the bamboo is a little slippery to walk on, especially when damp. 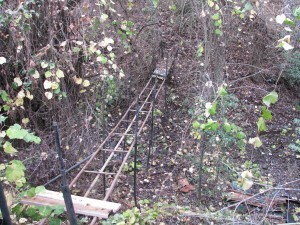 The bridge was built with a slight downward slope to it as well. 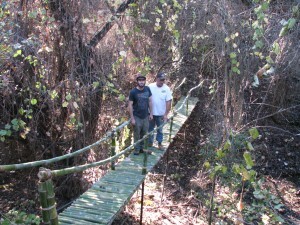 Strong enough for two big men: Jacob and Steve on the finished bridge! Ta-da! A really terrific and usable bridge! 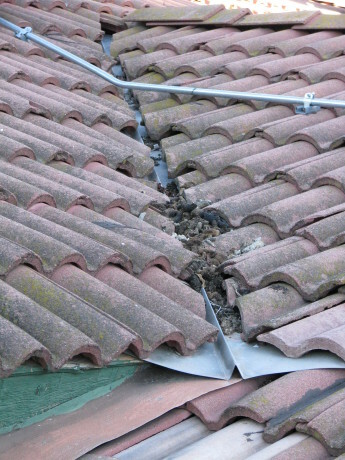 It certainly won’t pass OSHA safety standards, but its fine for a private home with no little kids around. The barranca looks like some exotic location, built with materials grown on site. Next projects include a small bridge, a short pier for the pond, and a ‘moon gate’ trellis for the passionvine that is out of control. Good thing I have a lot of bamboo.